Water levels were rising dangerously high and time was running out to rescue a team of soccer boys and their coach who had been trapped for two weeks in a Thailand cave. 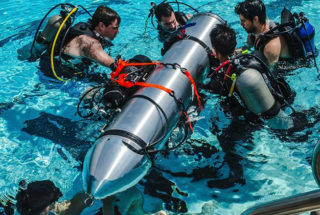 Thousands of miles away in Los Angeles, Elon Musk, the famed founder of the SpaceX rocket company, and his crew were holed up at the company’s Hawthorne headquarters designing and building a mini-submarine escape pod. News came Saturday as they raced to finish the aluminum sub that the first four boys had been rescued. Nine people were still stranded, however, and a coming monsoon threatened to flood the narrow caves. But one last thing was needed before the sub could be whisked off to Thailand: a pool big enough for a test. Nick Melvoin, vice president of the school board, was at a wedding in Oregon when he got a call from Musk’s chief of staff asking for help. By 11:30, the two were on a group call with Melvoin staffer Allison Holdorff Polhill and Don Parcell, director of operations at Palisades Charter High School. At midnight, Musk personally approved the underwater test at Pali, and by 12:30 a.m. Parcell met Holdorff at the pool. She had been board chair at the school before running against Melvoin in last year’s school board primary. She is now his senior adviser and director of community engagement. The Pacific Palisades high school is an independent charter school, meaning it is a public school and part of LA Unified but has its own board and functions under a contract, or “charter,” that governs all details of the school’s operation. SpaceX engineers arrived early Sunday with the sub. Melvoin and Musk were on the phone with their respective teams throughout the hours of underwater testing. “The SpaceX team had basically been awake for two days straight,” Holdorff said. “It was high pressure. It had to be tested once without anyone in the tube and once with a human being in the tube. They were so gracious to Pali,” said Holdorff, who fed the team from the farmers market that is held Sundays at the high school and whose son, an underwater photographer, documented the testing for SpaceX. By mid-afternoon, the sub was on a plane to Thailand and the pool, which is used by local sports teams and the community, was reopened to the public. As the rescue captivated the world’s attention, Melvoin said at LA Unified, “we care for all kids wherever they are,” and that he hopes the district can continue to use its resources to help — as it did two weeks ago during a toy drive for immigrant children detained at the border. On Tuesday, the school board unanimously passed Melvoin’s resolution directing the district’s chief lobbyist to advocate for a permanent end to family separations and for the district to offer free legal services for those impacted by forcible separation. About 100 children separated from their parents are being held in the Los Angeles area. “We had an asset that was helpful, and I hope this is the first of many times that we can use the district’s resources to help,” said Melvoin, who this week was appointed to a second term as vice president of the school board. He said the willingness of the director of operations and of district officials to work overnight to go over liabilities and make the pool available shows what can be done even in a district as big as LA Unified. Because of Pali’s quick help, SpaceX has invited 30 Pali students and five faculty members to participate in its Hyperloop competition on July 22, Holdorff said. This article has been updated to clarify Melvoin and Musk were on the phone separately with their respective teams.